Download a Free Irish Tourist Guide Here! Irish Coats of Arms Gallery and our Free Postcard Service. Traffic in Dublin has become worse in recent years due to a variety of reasons. If you are travelling into the capital city then try to do so outside the busy hours, typically from 7:30 to 10:00 in the morning and from 4:00 to 7:00 in the evening. Dublin operates a series of Bus Lanes in which it is forbidden to travel at certain hours of the day. Some Bus Lanes prohibit traffic at any time of the day. If you arrive in Dublin Airport and Dublin City is not your immediate destination then be sure to consider using the M50 motorway which is a ringroad around the city. This toll-road should be used by visitors arriving in the airport and wishing to travel to all destinations except the city centre itself. Similarly visitors travelling to the airport and wishing to avoid the city centre gridlock should try to interface to the M50 at some point and therefore avoid the traffic delays. Telephone charges are among the most expensive in Europe. If you must ring home then do so after 6pm in the evening as this is when the economy rate begins. If you have an international dialing service from your local operator you should definitely consider using it. There are other options such as SWIFTCALL who are long distance telephone call merchants. You could arrange to purchase a EURO 10 call-card from them before your trip, especially if you think you will be ringing home frequently. Do not use public or hotel payphones or credit card telephones in hotel lobbys as they are very expensive. VAT (sales tax) is refundable to non-European Union visitors on purchases that they bring back home with them. Be sure to obtain the tax refund documentation from the store where the item is purchased. The refund is processed at the refund agency's counter at the airport of departure. A refund service charge is payable, and the balance due to you can usually be credited to your credit card account or paid in a currency of your choice. All principal Irish airports have extensive tax free shopping areas. In the case of Dublin Airport you can call their Duty-free Express number 1800 747747 to check availability of and/or pre-order your tax free shopping in advance. Taxi fare rates vary around the country but in the urban centres drivers will usually charge EURO 10 as a minimum for a short journey. Travel from Dublin Airport to the city centre should cost about EURO 30 to EURO 40 (depending on the time of the day). Taxi drivers are allowed to use the Bus Lanes that are prohibited to other drivers. It is vital to book your accommodation well in advance when you are planning to visit Ireland. There are a variety of different accommodation options available to visitors including traditional Irish 'bed and breakfasts' which can charge anywhere from EURO 30 to EURO 100 depending on the quality of the accommodation and the time of the year (a big consideration!). Hotels of decent quality can cost anywhere from EURO 50 upwards per person. Expect to pay 80 to 100 for decent 3-star accommodation. These generally include breakfast although the new Jurys hotels offer accommodation without breakfast. If you are within the Dublin area you can ommit the prefix 01 for any of the numbers below that have that prefix. The emergency services can be contacted by telephoning 999. This number is accessible free of charge from any telephone and is the initial contact when requiring the Police (Garda), Ambulance, Fire Brigade or Lifeguard emergency services. The American Embassy can be contacted by telephone at 01/6688085. There is a complete legal prohibition on smoking in government offices, cinemas, restaurants, national heritage centres, etc. Smoking in Pubs is now completely banned. Smoking on streets is allowed. The following days are public holidays in Ireland, when many shops, banks and amenities may be closed: January 1st (New Years Day), March 17th (St. Patrick's Day), Easter Monday (often in mid or late April), first Monday in May (May Bank Holiday), first Monday in June (June Bank Holiday), first Monday in August (August Bank Holiday), last Monday in October (October Bank Holiday), 25th December (Christmas Day), 26th December (St. Stephen's Day). In Ireland it can rain at any time anywhere so bring a light rain-jacket with you! Temperatures vary from about 19-20 degrees Celsius during Summer to 0 to 3 degrees Celsius during Winter. The average national temperature is 9 degrees Celsius. 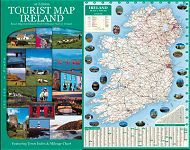 This document is free for your use and is an extract from the companion report - Ireland: 100 things to do, 500 places to Stay which is available from the Information about Ireland Site. 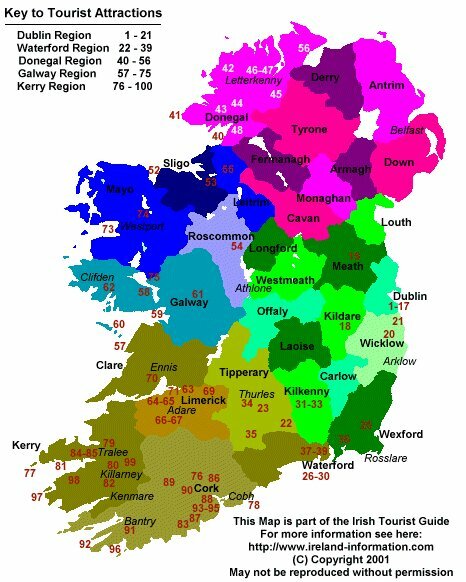 This excellent report will finally solve the problem of where to stay during your visit to Ireland. You will not be bored either because all the information you need to visit the 100 top attractions in Ireland are provided in this crammed report. 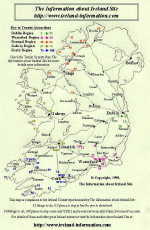 It gives you the benefit of being the ONLY guide you wil need on your adventure in Ireland. Further details are available at the download center where you can also save (and then print) the information on this page for free! Click here and you are on your way! By using this information you agree to indemnify The Information about Ireland Site against any consequence or loss, however caused.